September 2011 brought about one of the biggest additions to the layout - the installation of a printed backdrop. Our intention all along was to use a backdrop of rolling tree-lined hills from the area which would form the general backdrop and provide a horizon line. This would be overlaid with photographs taken of the actual buildings in the area, particularly along the main street. To this end we purchased a series of photographs taken of the scenery around Wallerawang from a professional photographer. These were 'stitched' together in the computer to form a long continuous backdrop. Test prints were made and trialled on the layout. Something about them did not look right and we were not happy with it and so alternatives were sought. The sky-blue painted plywood backdrop before the installation of the new paper backdrop. Rolling stock from a ballast train is parked in the goods shed siding. We searched numerous websites and eventually decided to try a Gaugemaster generic backdrop. At 2.7m long we would need 3 of these backdrops placed end-to-end to go the full length of our layouts timber backdrop. One of these Gaugemaster backdrops, GM702, was found and purchased from Woodpecker Model Railways and tested on the layout. It looked good and the decision was made to abandon the idea of using the purchased photographs and to instead use the Gaugemaster backdrop. After trawling the Internet we found the 2 additional Gaugemaster backdrops we needed at an on-line store in the UK, which were purchased and delivery arranged. The Gaugemaster backdrops were approximately 300mm high and were roughly half scenery and half sky. Having the horizon line that high on our timber backdrop did not look right and by lowering the horizon line there was not enough printed blue sky on the paper backdrop to cover our timber backdrop. So each paper backdrop was carefully trimmed along the horizon line to remove the blue sky portion and then the horizon line could be lowered to any height we wanted, leaving the blue painted timber above to represent the sky. 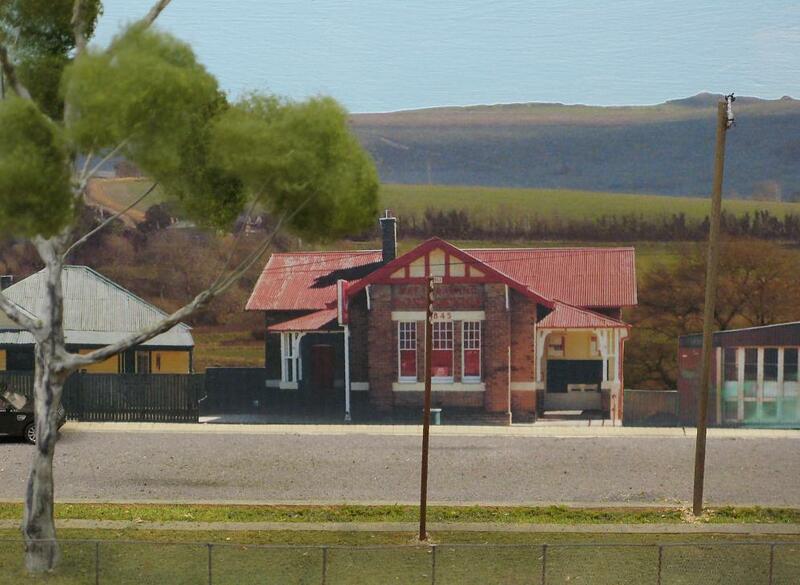 The newly applied backdrop across the road from the goods shed area. The rolling hills are the generic Gaugemaster backdrop while the shops are photographs scanned and printed to the appropriate size. 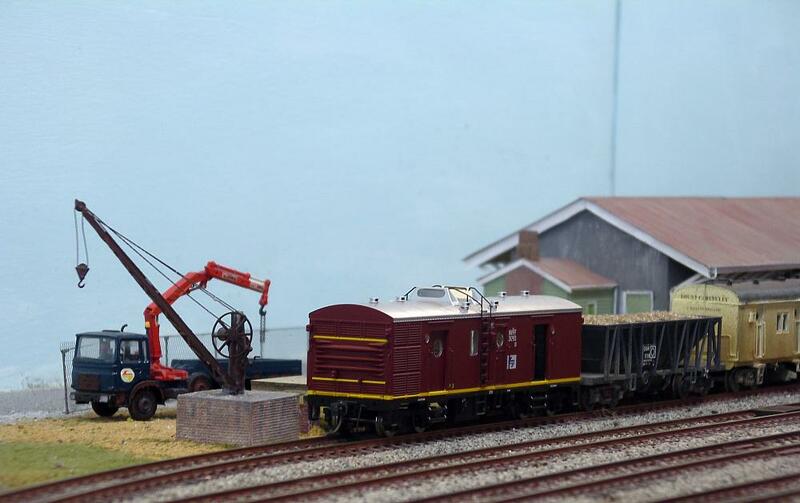 The S trucks sit at the goods shed ready to be shunted into the next pick up goods train. The bottom portion of each of the Gaugemaster backdrops had to be trimmed to match the scenery contours on our layout where the scenery meets the backdrop. This was carefully done by measuring and trimming each portion of the paper backdrop. Wallpaper paste was mixed and applied to the back of the paper backdrops and they were positioned onto the timber backdrops. This gave us some time to carefully position and align each of the paper backdrops, taking particular care with the joins, before the paste went off. Once the Gaugemaster backdrops were all applied and set we turned our attentions to the application of the building overlays. We used the photographs we had taken of all the buildings in the area when doing our field research for the layout some years ago. Each photograph was scanned into a computer so it could be printed out on paper at the size we wanted. Getting the scale of each building right was important. As we did not have any measurements of these buildings we took our cues from things in the pictures. Doors are usually of a fairly standard and consistent height so we printed each building so the door heights matched and the overall building size looked about right, particularly when placed and judged against neighbouring buildings. This took quite a lot of trial and error printing but eventually we got each one right and were comfortable with the scale of each building. These were all placed along the backdrop where they should go and in their correct order. We had too many buildings to fit along our modelled main street so some of the lesser buildings were culled. The pictures were then fixed in place again using wallpaper paste. Three buildings along the main street printed from scanned photographs. The historic Post Office building is in the centre. Various scenery applications of Woodland Scenics clumping foliage were judiciously applied to disguise the junction of the horizontal scenery where it meets the vertical backdrop. The Gaugemaster backdrop seen behind the grassed area near the road overbridge. The paper backdrop needed extensive but careful trimming to fit into this area and the lower edge has been enhanced with foliage clusters. The road vehicles are both by Busch. The purchased professional photographs were not a total loss as they contained a terrific shot of the local power station that we used as an overlay on the backdrop on one of the end modules. The photograph looked a bit odd where it cut off part of a conveyor belt so we printed extra copies and trimmed extra pieces of the conveyor belt part to extend its length until it could disappear behind the tree-line. Extra prints of the trees were also carefully trimmed and applied to disguise any other odd-looking edges. An 82 class loco leads an Up loaded coal train past the Wallerawang power station. The Gaugemaster backdrop forms the rolling hills and the horizon line. 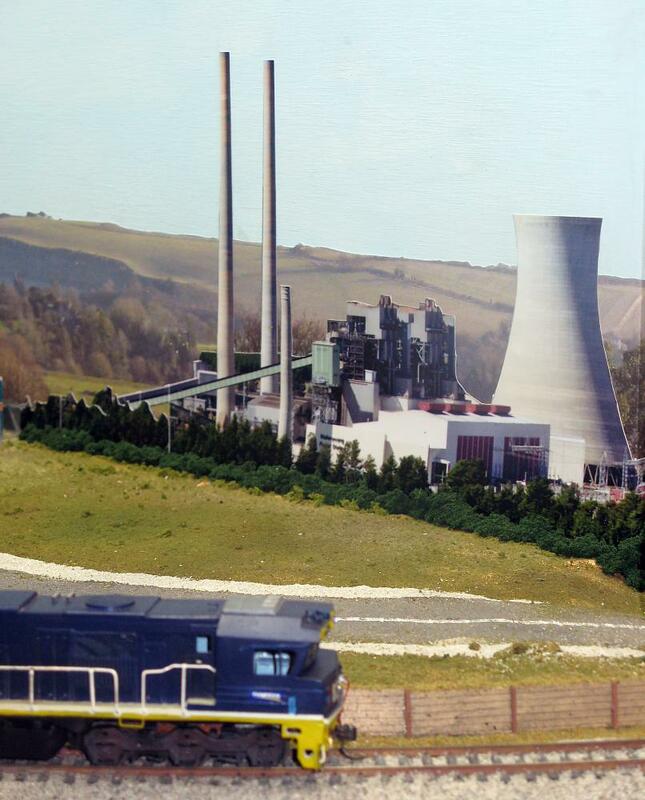 Photographs of the power station have been fixed over the Gaugemaster backdrop. 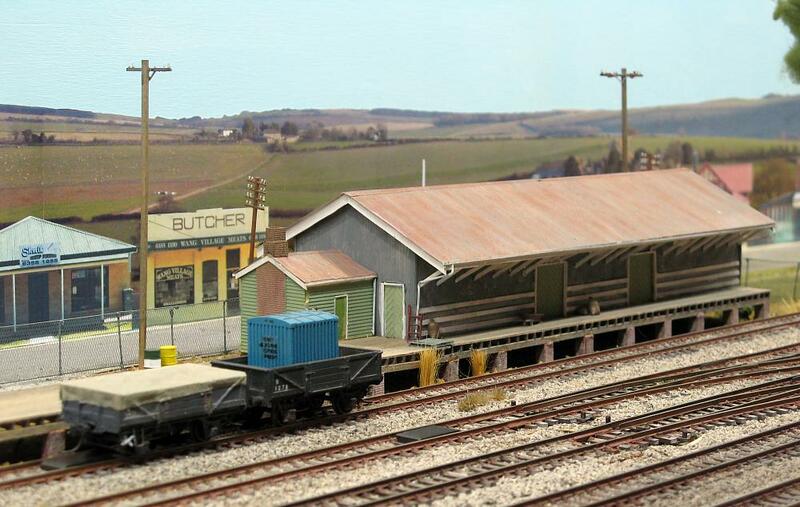 The layout had to be set up on the Friday before the October long weekend ready for the 3 day Liverpool exhibition. The application of the backdrops was completed on the Wednesday before - just in the nick of time!